Noise Block, Smart Throttle, Pulse Width Modulation, Electric Start and the EF3000iSEB features Yamaha Boost Techology. The ultimate in lightweight portable electricity! 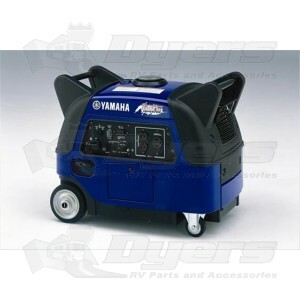 Yamaha Portable Generators give you the power you need where you need it. Pulse Width Modulation (PWM) delivers clean power so you can use it confidently for powering computers, solid-state appliances with built-in computer functions or microcomputer-controlled power tools. Lightweight and easy to carry. Noise Block acoustically designed sound reduction system produces unbeatable noise reduction. Smart Throttle Load sensing throttle control automatically adjusts engine speed to precisely match load, resulting in greater fuel efficiency and noise reduction. Oil Watch warning system and electrical overload breaker help prevent engine damage. Super-quiet muffler with USFS-approved spark arrestor eliminates errant sparks. Overhead valve engine with cast iron cylinder liner is efficient, reliable, powerful providing long life and excellent heat dissipation. DC output recharges 12 volt batteries for RV, auto, marine, aircraft, and more with included battery cables. Ever need a little boost - extra power that gets your tool or air conditioner started quickly and efficiently? Yamaha Boost Technology™ (YBT) increases output by adding battery voltage to alternator when needed. Boost Control Unit (BCU) senses when extra power is needed and ups the output for up to 10 seconds, ample time to give air conditioners, power tools and equipment that extra boost of power they need to start quickly and efficiently, increasing the life of the tool or appliance. The Boost Control Unit in the generator automatically senses when you need additional boost and uses power from the internal 12-volt battery to produce additional amperage. With the additional 10-second boost, the power is comparable to a conventional 3500-watt generator. Runs continuously for up to 19 hours without refueling (at 1/4 rated load with “Economy Control” function on. Exclusive dual coil alternator stator reduces noise, fuel consumption and engine wear by running at lower engine speed. Electric starter for effortless starting and easy operation. *See Spec Sheet for full details. - In the unlikely event you receive a defective unit, it will be repaired/replaced per the manufacturers guidelines. Inverter System with Pulse Width Modulation - Industry-leading system that produces higher-quality and cleaner electricity. Results in pure sine wave as clean or cleaner than commercial power and can operate products with built in microcomputers. Noise Block Acoustically designed sound reduction system - The full enclosure is made of sound absorbing material used in key locations inside the enclosure along with newly designed muffler and molded fan produce unbeatable noise reduction. Smart Throttle Load Sensing Throttle Control - Automatically adjusts engine speed to precisely match load, resulting in greater fuel efficiency and noise reduction. Oil Watch Warning System - Automatically shuts off before oil level is low and cannot be re-started until oil is added. Prevents engine damage and costly repairs while enhancing long-term durability. OHV 171cc Engine (Overhead Valve) - Offers increased reliability, low oil consumption, noise-reducing operation and increased peace of mind. Long Run Time - Runs Continuously for up to 19 hours without refueling (at 1/4 rated load with "Economy Control" function on. Centralized Control Panel - Control Panel enables easy access to controls. Electric Starter - Effortless starting and easy operation. Wife and I took out new Yamaha 3000 with boost to Door County, Wi for its first trip. It did everything just like the blogs I read said. Quiet and Powerpacked. I took a decibel reading it was 49db. I enjoy the fact that it is heavy so no one person can walk away with it. I recommend this generator to other campers that just want to have power on demand when it's needed. And to be able to go off the grid and relax in comfort. I did try the a/c and my wife's hair dryer on at the same time. WOW not a problem.